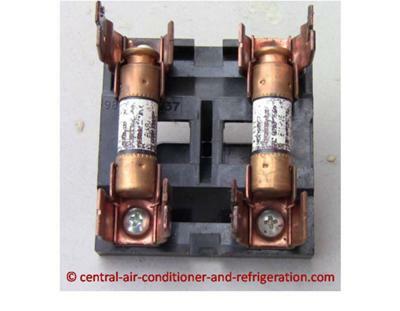 What is central air conditioner fuse? An air conditioner fuse prevents any parts of HVAC to overload or overheat. Is a safety (device) that tells the HVAC unit, ok - you supposed to draw 30 Amp. If any part of you draw more than 30 Amp, I’m gonna turn you off. 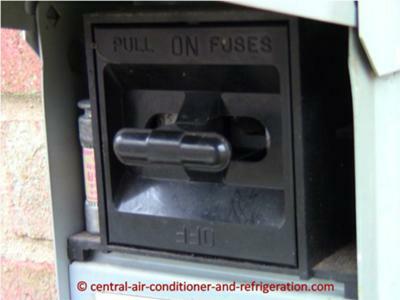 The fuse box should be in the line of vision; it should be within REACH from the condenser unit location. 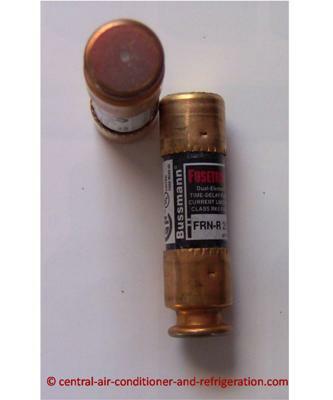 The fuse for HVAC unit is Heavy duty time delay cartridge fuses. The fuse is within the fuses holder. The within REACH disconnect is in metal box. It is either a handle that you pull out, within this handler, there is two fuse in the fuse holder. Or there is breaker. If there isn’t disconnect box within REACH, there should be breaker box within 5 feet from the condenser unit. 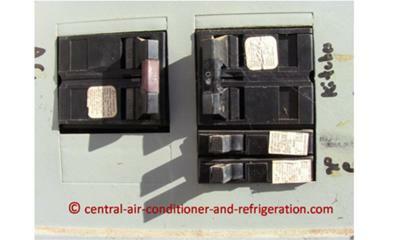 The condenser switches are within the breaker box. Indoor and outdoor unit have TWO different fuses switch. Indoor unit has it owns fuse or breaker switch, the same for the outdoor unit. Can I put two different Amp fuse in the fuse holder? No. If the original fuse were 30 amps. You should replace it with another 30 amps fuse. The fuse should be time delay fuse. It should say that in the fuse. The 5 watt fuse blows in the air handler. This only happens when the outside unit kicks on. The air handler will run if there is no power to the outside unit. Changed stat wires and it still blows the fuse. Condenser unit blow fuses right away. Why? My heat is not working and was getting a burning smell when it was upon investigation I found my disconnect box in the house didn't have fuses or breakers inside it had what appears to be 2 copper pipes and the wires in the box are burnt up. Is this usual I just had my unit installed 3 years ago by a licensed HVAC tech. Unit is getting power but not generating cool air. Fan on unit is not turning. do I need a separate breaker for central air ? If my AC condenser has a 30 amp fused disconnect outside by the unit, can it have a 50 amp breaker in the panel? I guess I just don't understand why it needs a fuse to act as an overcurrent protection device at the disconnect, and another one at the main panel? I recently had my blower motor and capacitor replaced, when I had to use the central ac unit. Now that its cold out I'm trying to use the furnace and it will only work when the thermostat is in the on position but blower will not kick on when I put it on auto. The coils are heating up in auto position but blower will not kick on. It only works if I put it on ON and then it kicks the breaker after about 10 minutes.